Hollyhock Quilts: Let's Celebrate My New Look With a Giveaway!! Let's Celebrate My New Look With a Giveaway!! I'm really having fun with my new look and I think I'll celebrate with a giveaway! 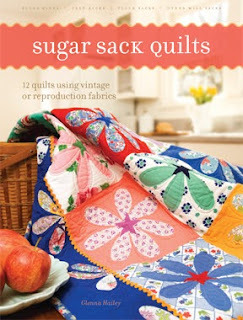 It's been awhile since I gave away a copy of "Sugar Sack Quilts" so I think that's in order. Click on the link to learn more about it. I'm rewarding my wonderful followers with this one, so if you're already a follower, THANK YOU!! Just leave me a comment that you are and you'll be included. If you're not a follower yet, become one and leave me a comment that you did! If you already have a copy of my book, go ahead and enter again! Surely you know someone who could use one as a gift, right?